Our water damage Wilsonville techs at 911 Restoration of Portland are the company you want on your side when you need assistance after a flood or leak has damaged your home. We know that after water invades your home there is nothing you want more than to immediately get it back to normal, which is why we are available 24/7/365. When you call our office, they will ensure that we will arrive at your home within 45 minutes or less, ready to provide you with a free home inspection. Our IICRC certified our water damage Wilsonville pros will always go the extra mile to get your home back to the beautiful condition you know and love, so call us today. It is important to our water damage Wilsonville crew that we provide you with same day services when it comes to dealing with water disasters. This is because the longer water sits on the property, the more damage it can cause. Some of the hardest areas in the home to get moisture removed from is in the crawlspace and the attic. This is mostly due to the fact that homeowners rarely check these areas of the home, making it possible for damage to go unmitigated for a substantial amount of time. This can be exceptionally destructive if you are dealing with a broken sewer line and black water has invaded the crawlspace. Our water damage Wilsonville unit is expertly trained to decontaminate the home after black water damage. So, call us the moment you begin to notice any signs that water may be causing trouble in your attic, crawlspace, or any other part of the home, and our water damage Wilsonville techs will get your home completely sanitized. One of the most important components to every home restoration job is the element of good customer service. 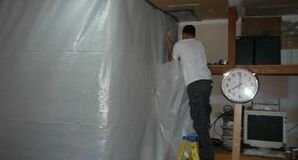 Our water damage Wilsonville professionals understand how sensitive this situations is, and will do whatever it takes to make things easier for you. We are licensed, bonded and insured to handle all aspects of the restoration process, including helping you with your insurance paperwork. If you haven’t used your insurance before, it can be confusing to understand what is and what is not covered. However, our water damage Wilsonville team will file your claim for you, ensuring that your provider gets all the information needed to give you the best chances at obtaining full coverage. Call our water damage Wilsonville operation at 911 Restoration of Portland today and we guarantee that you will get the proper care you need to get on a fresh start.